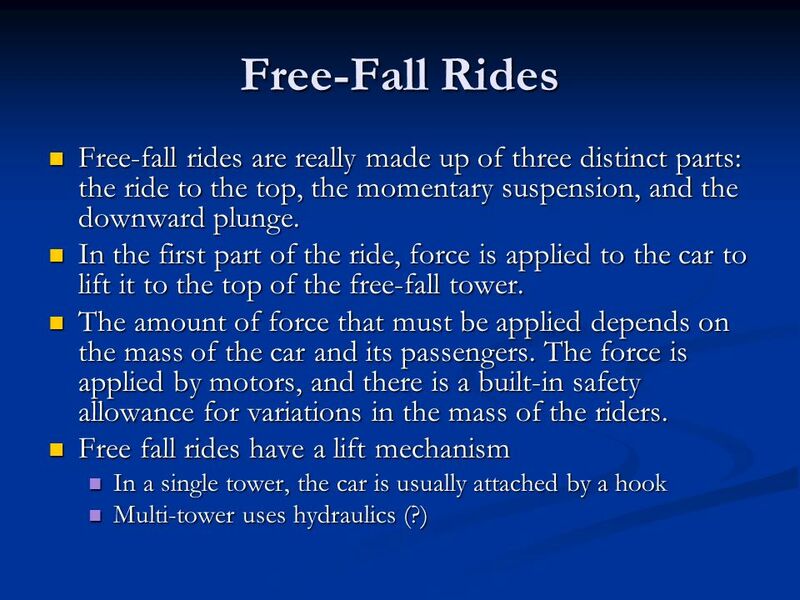 3 Free-Fall Rides After a brief period in which the riders are suspended in the air, the car suddenly drops and begins to accelerate toward the ground under the influence of the earth's gravity. The least massive and most massive riders fall to the earth with the same rate of acceleration. 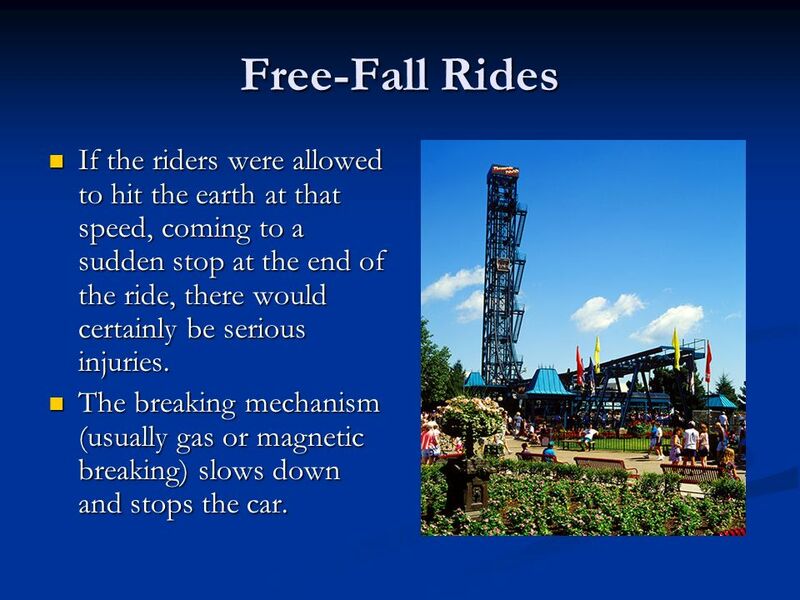 4 Free-Fall Rides If the riders were allowed to hit the earth at that speed, coming to a sudden stop at the end of the ride, there would certainly be serious injuries. The breaking mechanism (usually gas or magnetic breaking) slows down and stops the car. 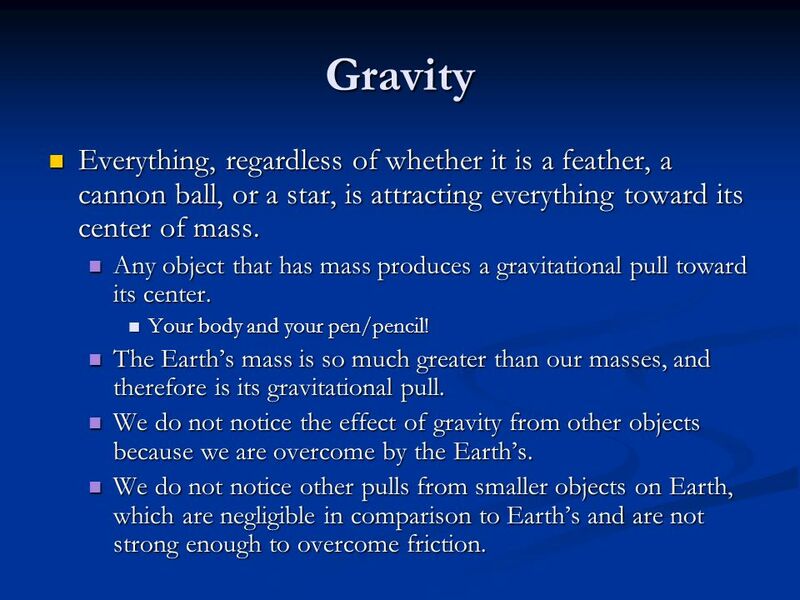 6 Gravity Everything, regardless of whether it is a feather, a cannon ball, or a star, is attracting everything toward its center of mass. 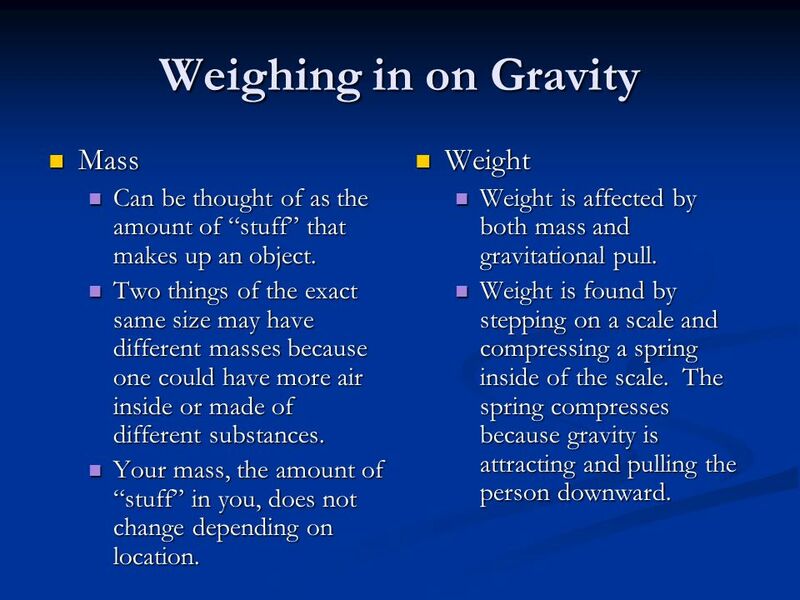 Any object that has mass produces a gravitational pull toward its center. Your body and your pen/pencil! The Earth’s mass is so much greater than our masses, and therefore is its gravitational pull. We do not notice the effect of gravity from other objects because we are overcome by the Earth’s. We do not notice other pulls from smaller objects on Earth, which are negligible in comparison to Earth’s and are not strong enough to overcome friction. 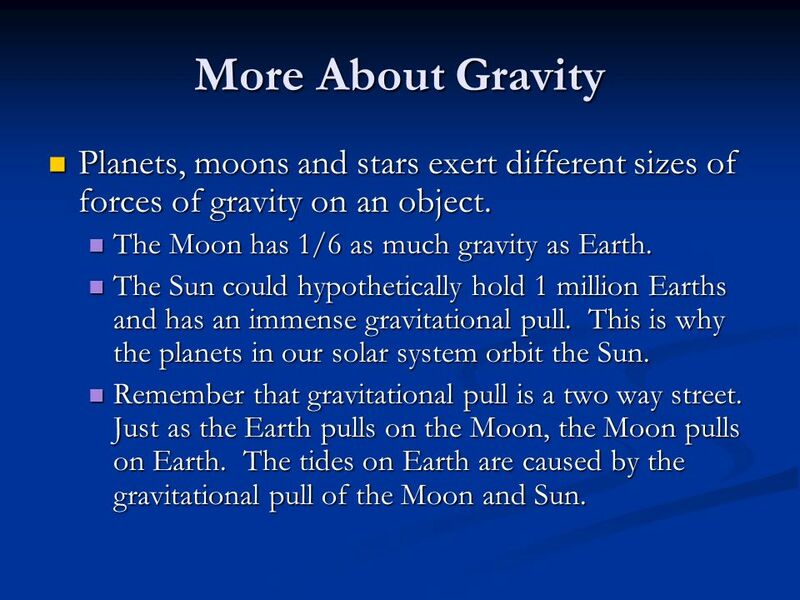 8 More About Gravity Planets, moons and stars exert different sizes of forces of gravity on an object. The Moon has 1/6 as much gravity as Earth. The Sun could hypothetically hold 1 million Earths and has an immense gravitational pull. This is why the planets in our solar system orbit the Sun. Remember that gravitational pull is a two way street. Just as the Earth pulls on the Moon, the Moon pulls on Earth. The tides on Earth are caused by the gravitational pull of the Moon and Sun. Can be thought of as the amount of “stuff” that makes up an object. Two things of the exact same size may have different masses because one could have more air inside or made of different substances. Your mass, the amount of “stuff” in you, does not change depending on location. 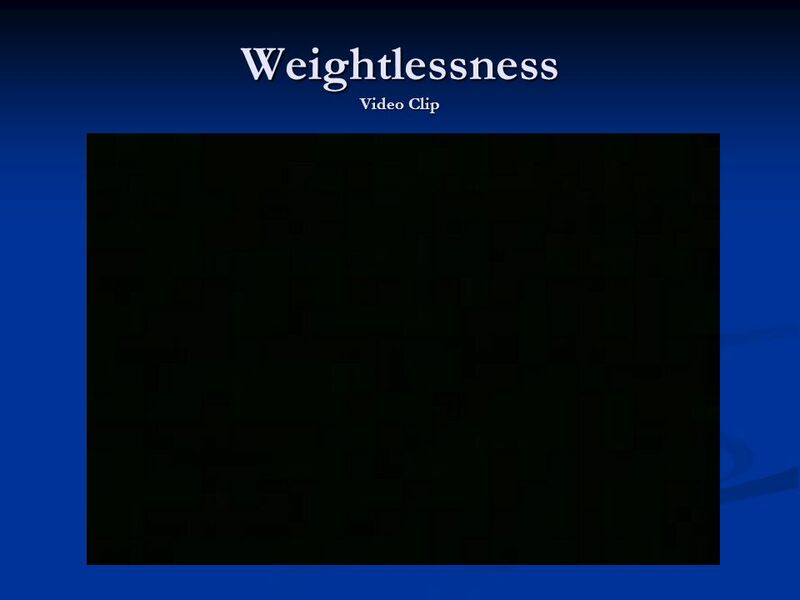 Weight Weight is affected by both mass and gravitational pull. Weight is found by stepping on a scale and compressing a spring inside of the scale. The spring compresses because gravity is attracting and pulling the person downward. 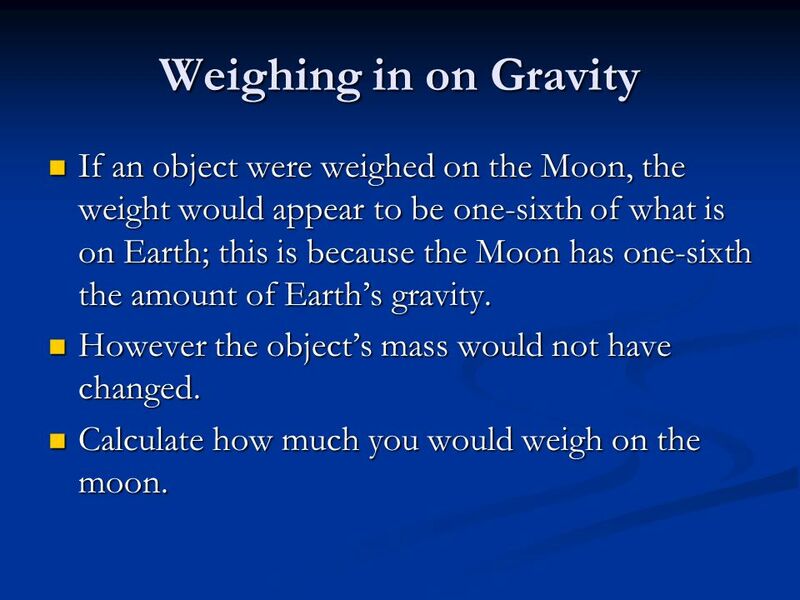 10 Weighing in on Gravity If an object were weighed on the Moon, the weight would appear to be one-sixth of what is on Earth; this is because the Moon has one-sixth the amount of Earth’s gravity. However the object’s mass would not have changed. Calculate how much you would weigh on the moon. 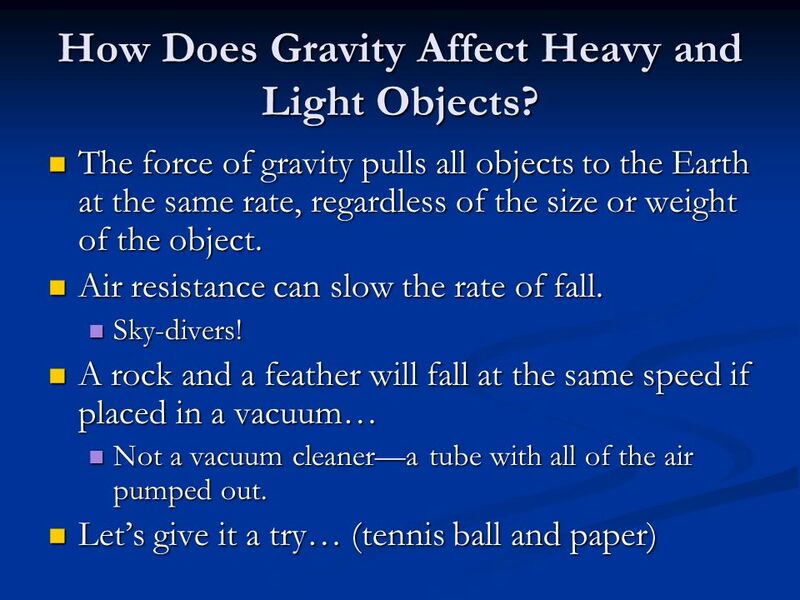 11 How Does Gravity Affect Heavy and Light Objects? 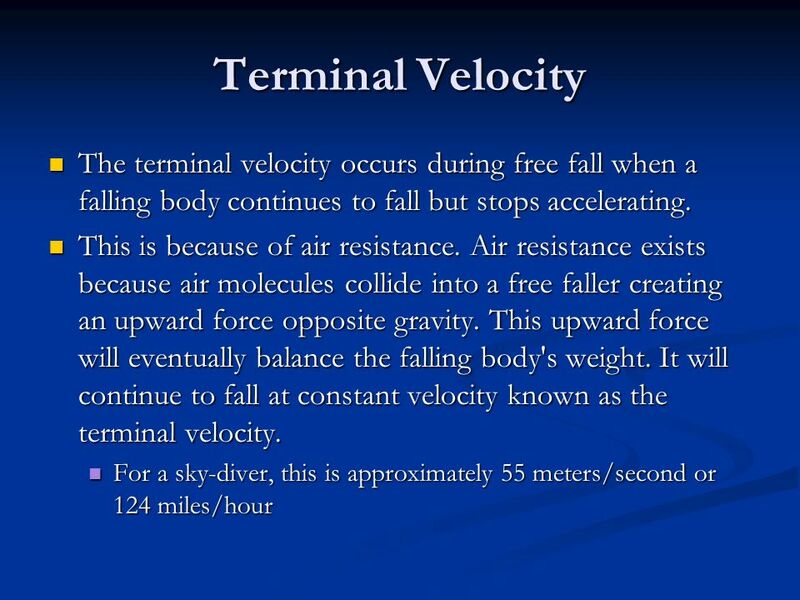 12 Microgravity Microgravity—means that some of the effects of gravity are minimized. Free-fall rides provide a brief glimpse of this—a sense of weightlessness. 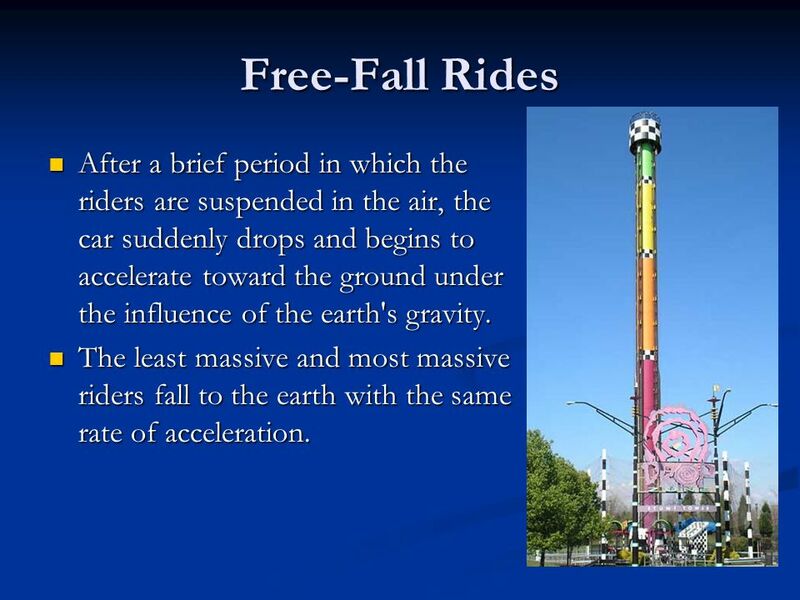 You are falling at the same rate as the ride car so the effects of gravity seem to disappear. 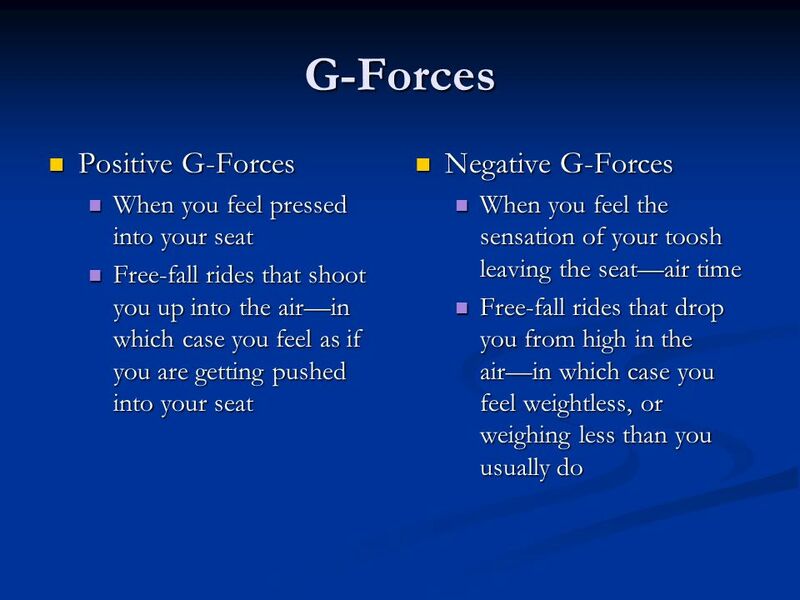 Riders experience the weightless feelings for less than 2 seconds. 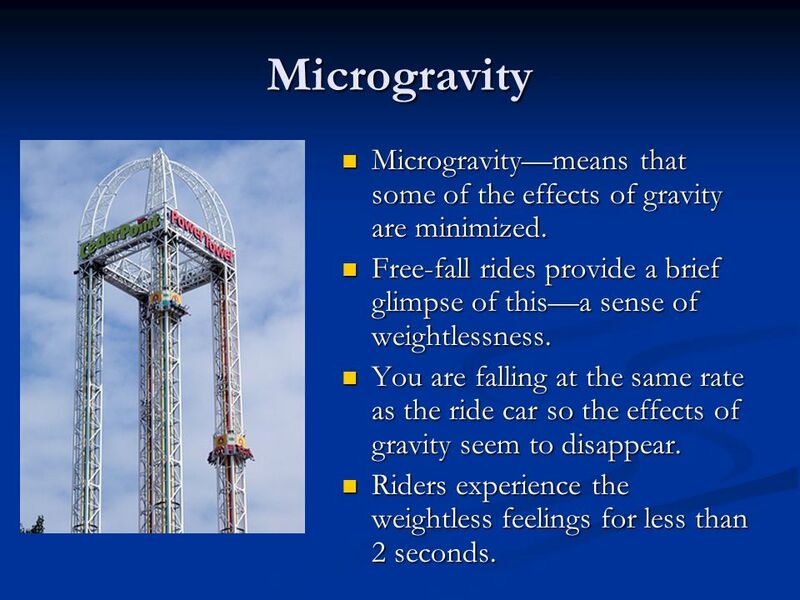 13 Microgravity If you could stand or sit on a scale during a free-fall ride, it would show that you would weigh less than normal. Remember the spring in the scale? In order for the scale to read your weight, the spring must be compressed by a force (the downward force of gravity on your body). 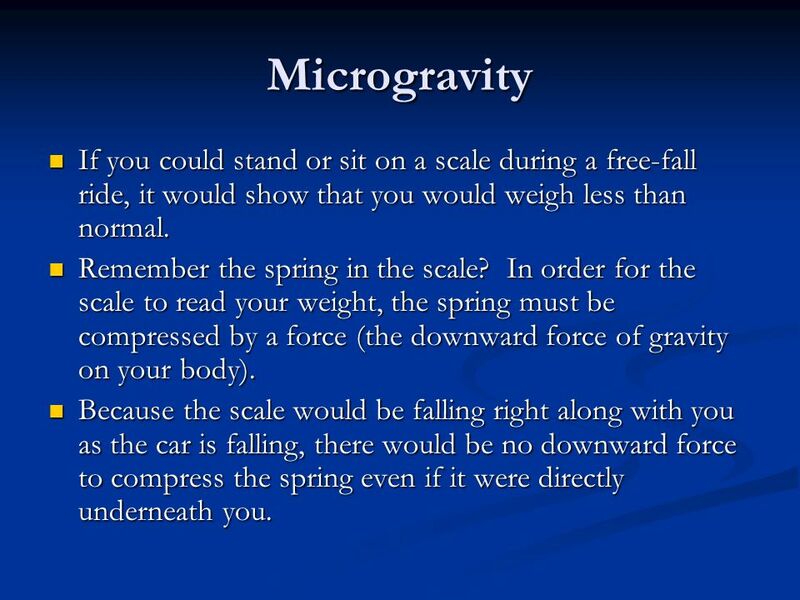 Because the scale would be falling right along with you as the car is falling, there would be no downward force to compress the spring even if it were directly underneath you. 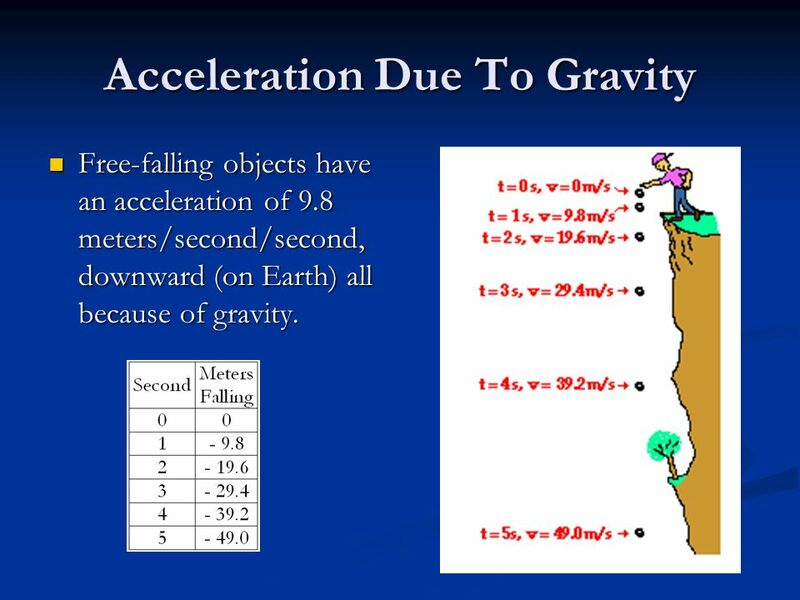 Free-falling objects have an acceleration of 9.8 meters/second/second, downward (on Earth) all because of gravity. 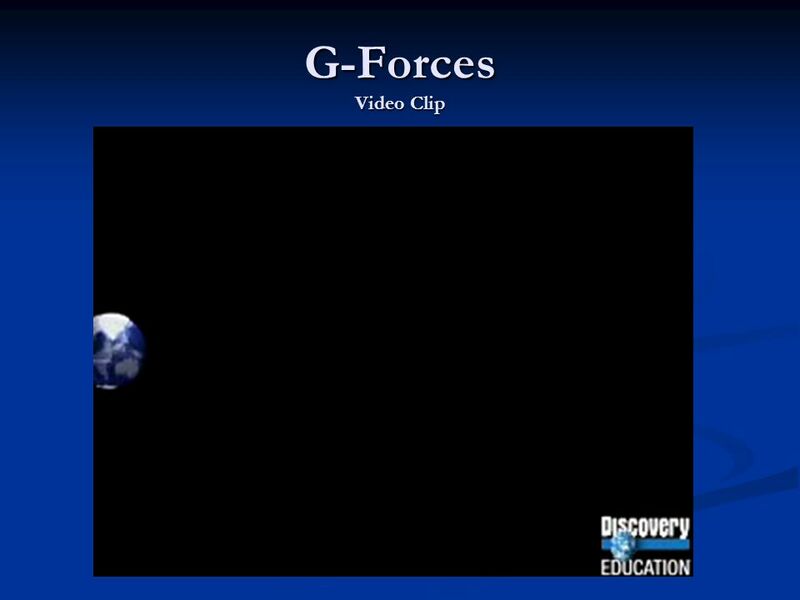 1 “G” is the normal pull of gravity. 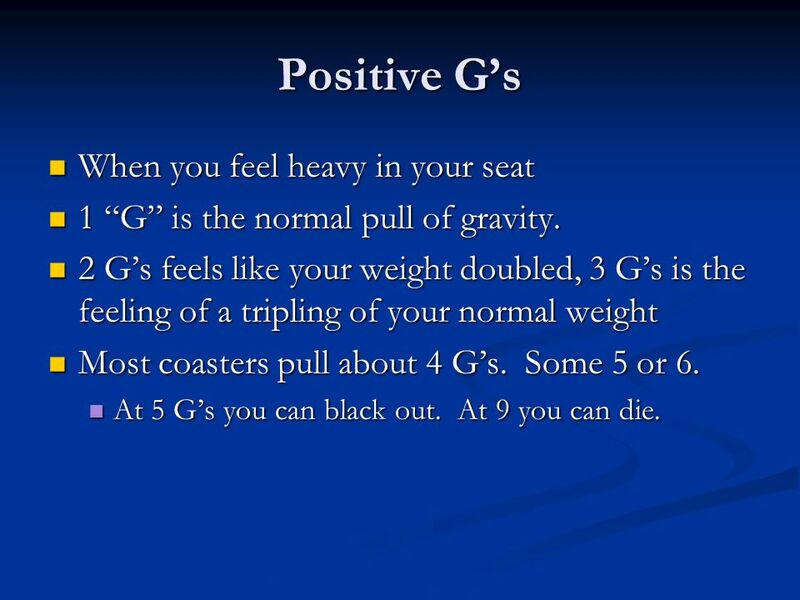 2 G’s feels like your weight doubled, 3 G’s is the feeling of a tripling of your normal weight Most coasters pull about 4 G’s. Some 5 or 6. At 5 G’s you can black out. At 9 you can die. 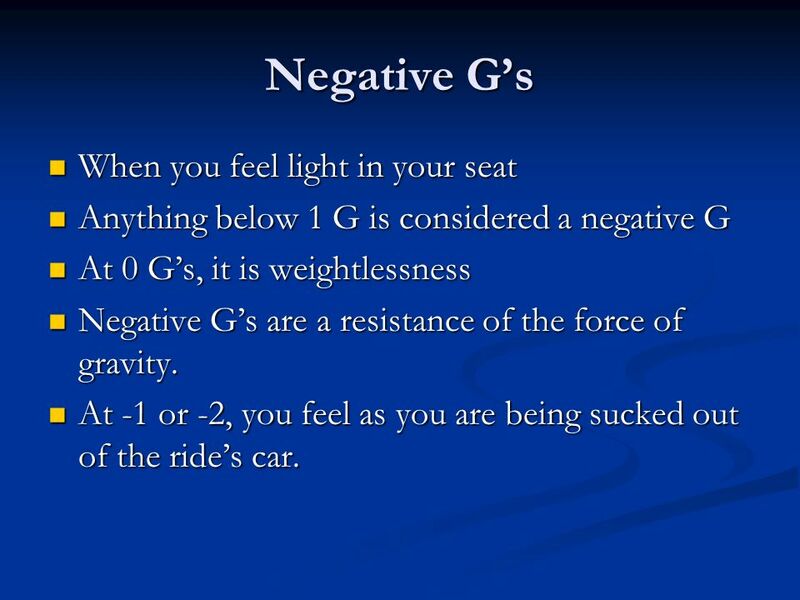 Anything below 1 G is considered a negative G At 0 G’s, it is weightlessness Negative G’s are a resistance of the force of gravity. At -1 or -2, you feel as you are being sucked out of the ride’s car. 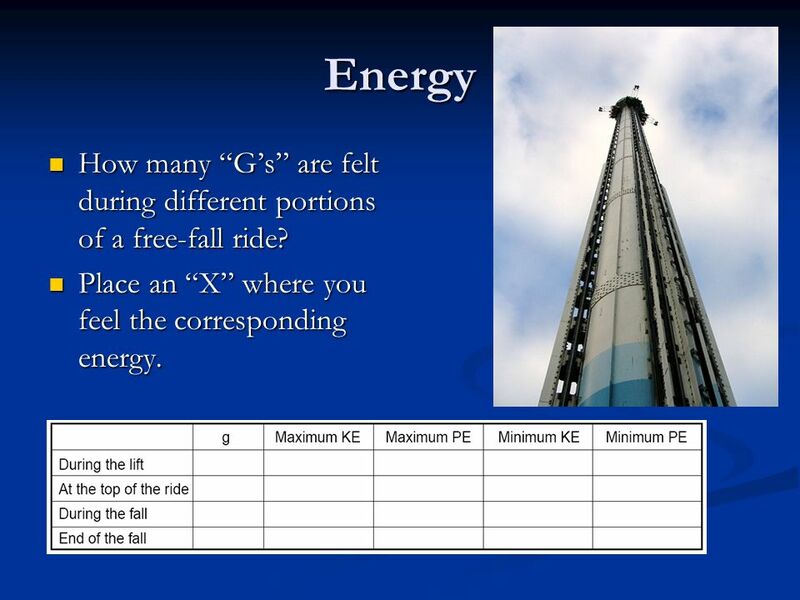 22 Energy How many “G’s” are felt during different portions of a free-fall ride? Place an “X” where you feel the corresponding energy. 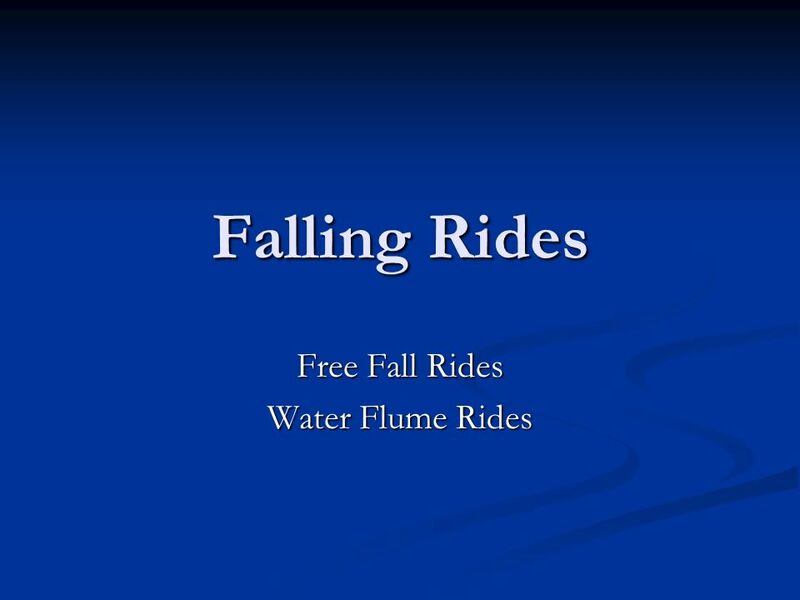 Download ppt "Free Fall Rides Water Flume Rides"
A roller coaster is called a roller coaster because coasting is what it does, after it starts it continues coasting throughout the track. Many of. FORCES ON A ROLLER COASTER DAY 5. ESSENTIAL QUESTION WHAT FORCES CREATE THE THRILL OF A ROLLER COASTER RIDE? Mr. McMartin Beta Pod Science. Gravity and Motion  Suppose you dropped a baseball and a marble at the same time from the top of a tall building. Which. 1.What type of forces are observed in the diagram? Balanced forces 2.Determine the net force placed on the piano. 25N + 20N = 45N 3. Which way will the. What are Forces?. What are forces? A force is a push or a pull. We learned that Newton’s 2 nd Law states that a Force is equal to the mass of a moving. Falling Objects and Gravity. Air Resistance When an object falls, gravity pulls it down. Air resistance works opposite of gravity and opposes the motion. Essential Question: How do mass and distance affect the gravitational pull of an object? Standard: S8P5a. Recognize that every object exerts gravitational. Gravity and Freefall. 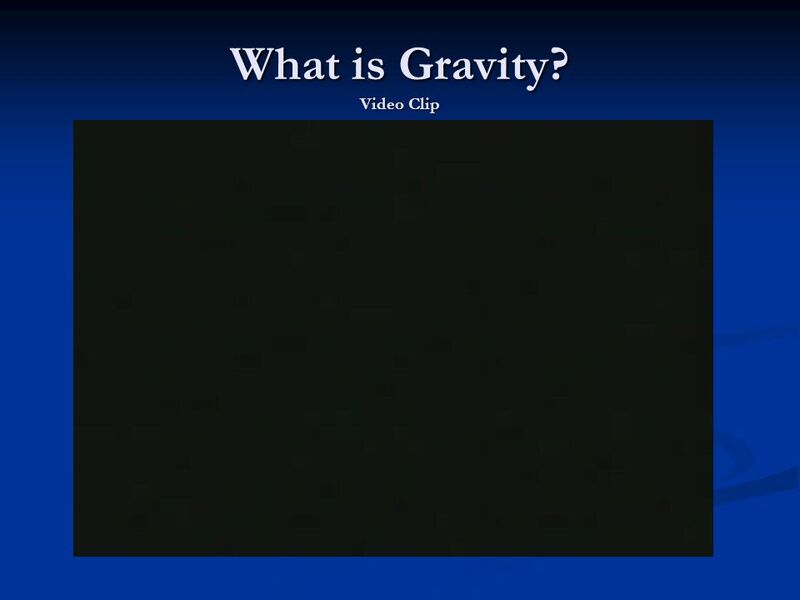 Gravity pulls on all objects on the Earth, trying to pull them to the center of the Earth. We measure the amount of pull on your. 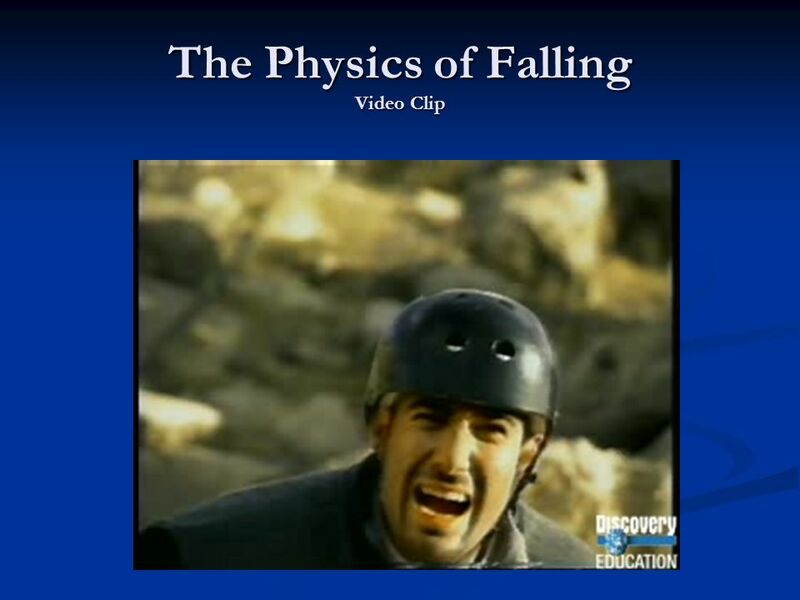 Lecture: Forces, Motion, Gravity and Friction d-s.
What are Forces? A force is a push or a pull on an object. 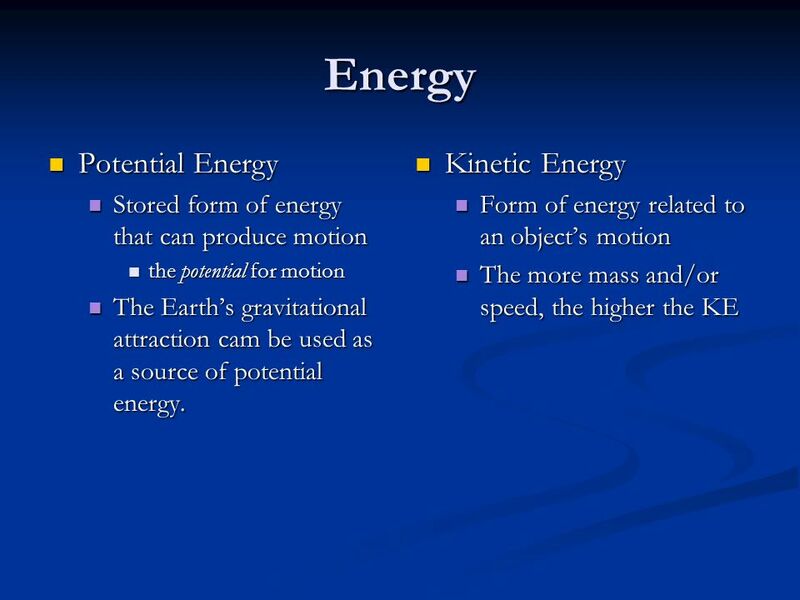 Motion is one of the key topics in physics. Everything in the universe moves. It might only be a small amount of movement and very very slow, but movement.